This is a sponsored post. Make sure to enter the $250.00 GIVEAWAY at the bottom of this post! Our Christmas tree is the focal point of our homes. There are as many styles and decorations as there are trees. Real or faux, most of us want our Christmas trees to be meaningful and memorable. And some of us have some pretty funny stories about the year the tree fell over or the year the cat climbed in and up and would not come out! Presents go under the tree, pictures are taken by it and we all gather ’round it on Christmas morning. Let’s talk about the six elements that will make our Christmas trees be the star it should be! Today on our podcast DECORATING TIPS AND TRICKS we are talking about COLOR TRENDS FOR 2018. This coming year you will be surprised what colors the experts say are on the horizon. Here’s a hint… my kitchen is right in style! 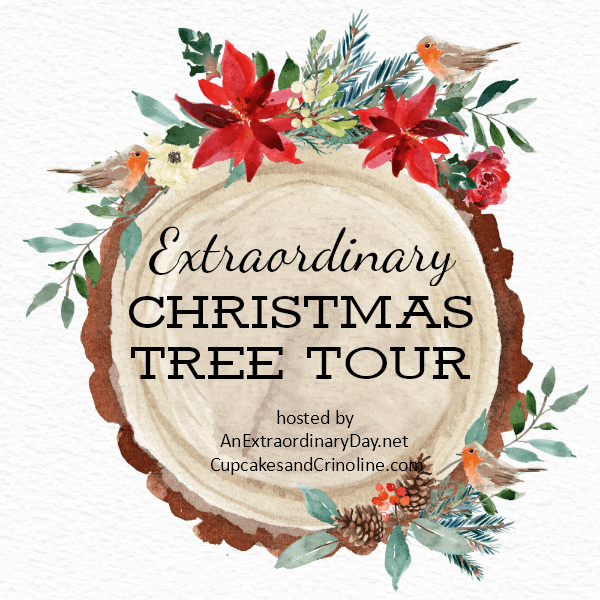 A big thank you to Diane at An Extraordinary Day and Mary Beth at Cupcakes And Crinoline for all their hard work putting this tour together. I’m sure you will get tons of ideas for your Christmas tree!!!! This year’s tree was a bit of a surprise to me. I originally was going to create a silver, white and green tree. But when I started to put the white balls on it I really liked it just like it was. 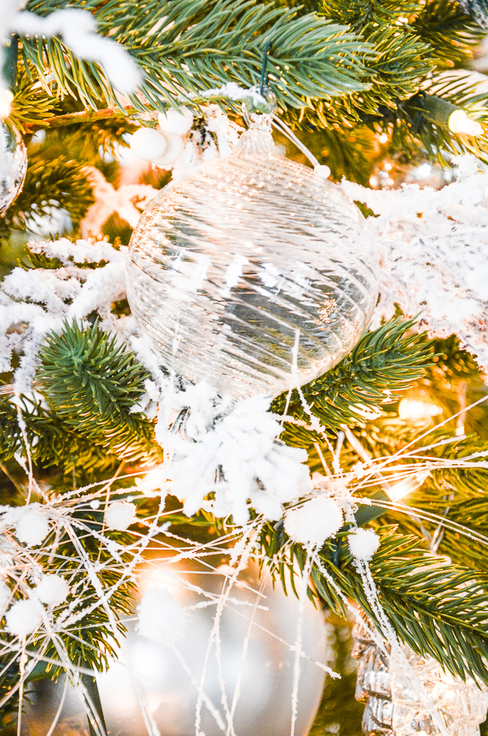 Here are a few things you can do to make your tree a standout! One of the first things I do when I’m thinking of putting up a tree is to decide what colors I’ll be using on my tree. I want my tree to work with the overall color scheme I’m going to deck my home in for Christmas. This year’s overall colors are silver, white and green. And my theme is “a walk in the snowy woods”. I used lots of trees and faux snow and pinecones to create this look. Even if you have lots of ornaments that have special meaning to you it is okay to rotate them from year to year to work with your color scheme. 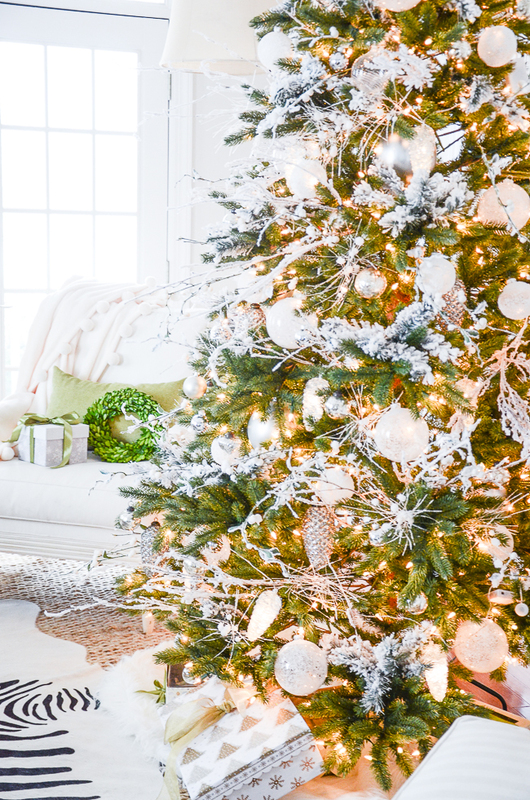 Whether your tree is real or faux you want to find its best side and put it front and center. Also, if it is faux you want to take your time and “fluff” it! Straighten out all the branches and separate them from one another. Make your tree look full! Every branch of a faux tree should be worked on. I know this takes time but your tree will look amazing! When adding lights to a non-lit tree make sure to weave the lights from the inside to the outside of a tree. Taking the time to do this will make the biggest difference! You should think about having about 150 lights per linear foot of a tree. If you have a seven foot tree you should think about adding one thousand fifty lights. Yes, that is a lot of lights but so so worth it. The next important thing to do after the tree is lit is to add “filler”. This year I fake flocked my tree. I love the look of snowy branches and I’ve been collecting lots of sprays of faux evergreen covered with flocking, glitter and white berries. I even found a garland that had white pom poms and white looking plastic fishing line that looks like fireworks. I cut the garland apart to put little bits in the tree. Filler does just what the word says, it make a tree look full and interesting. I usually use some sort of branches to stick out from the tree as a filler too. Just slide the branches into the tree and let them rest on the branches. Lots of flocked sticks and twigs in my tree! One extra step I took was to add pinecone lights from Jackson And Perkins. They are so so pretty. Just look how they light up! I put 5 strings of pinecone light on this year’s tree. The front side of the pinecone is clear and the back of each pinecone is silver. They really added an extra sparkle to my tree and everyone who has come to visit has commented on them! The next thing to do to make a tree special is to add lots of Christmas ornament. It takes many more ornaments than we really realize. A tree should look laden down with ornaments. Vary size and color and make sure the ornaments are evenly distributed! Don’t just add balls to the outward branches of a tree but hang solid color Christmas balls deep inside the tree. This gives a tree great depth. I made the snowball ornaments above several years ago. They were so easy to make and cost very little! A win/win! I took clear glass Christmas balls, painted them with Mod Podge and rolled them in Epson salts. So easy! Another way to dress up a Christmas tree after all the Christmas ornaments are added is to add garland, ribbon, etc. Drape it horizontally or vertically! Both can look beautiful. For this year’s tree, I went without the extra embellishing. It looked finished to me! When we get to this point our tree is almost done! Now is the time to decide what to top off a tree with. A star, ribbon, angel, top hat or spray of filler? Or like I did this year, let its natural beauty shine! This tree looked done with just a little bit of filler at its peak! And look at the “feet” of a tree. Make sure to cover the stand. 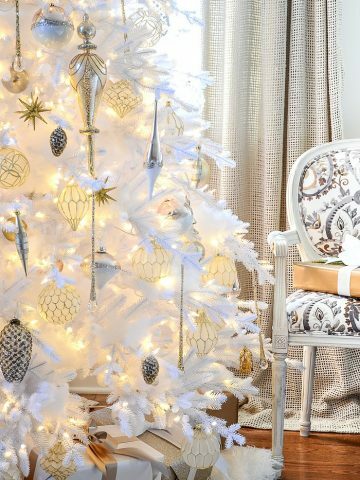 Use a tree skirt, a swath of great material, a tablecloth or any pretty soft material. Burlap looks fabulous too! This year I chose to add two Mongolian sheepskins around the base of my tree. They add a very soft, cloudlike look to the bottom of the tree! There you go, six elements to make a Christmas tree extra special. What do you do to make your tree fabulous? Make sure you stop by and see all these amazing Christma trees! The kind folks at Jackson And Perkins are giving away a Jackson and Perkins Gift Card for $250.00 to one lucky winner. To enter go to JACKSON AND PERKINS and look around at their gorgeous holiday offerings. Then come back and tell me what you would love to have in your home by leaving a comment below!!!!! Your comment is your entry! You might want to get a few strings of my pinecone lights with part of your winnings. You can comment until Dec 17th. Winner will be announced on our podcast Decorating Tips And Tricks. A big thank you to my wonderful sponsor Jackson and Perkins. Yvonne I want to tell you that I learn so much about fundamentals of decorating through your blog. Our Christmas decor is very different (I’m all about vintage pink and aqua) but your advice carries over into my style and makes my decor look “finished” rather than random. Thanks and Merry Christmas! I love pink and aqua! I’ve been thinking pink for a future Christmas. Oh how I love the log lanterns since I decorate with moss and curly willow year round….I will order and I’m following all your suggestions for next Christmas…..Thanks! I love all your posts….They are always an inspiration! Love the tabletop trees and the amaryllis plants. I would love a gardenia plant in my home this Christmas! The beautiful white, fragrant flowers and the gorgeous glossy leaves take me back home down south to my Mom’s home and a simpler, less stressful time. There was a huge gardenia bush right outside my window and the fragrance made opening the window in the summertime heat a must! Yvonne your tree is magazine worthy, which is no surprize all your creations are. Unfortunately several of the Jackson & Perkins items I’d love to have or sold out like the Coronation Amaryllis Gift and the Reindeer Knit Throw. Never fear though, I’m sure there are a few other hundred items I would be happy to get. Thank you for the chance to win. Merry Christmas & Happy New Year!! Definitely the pinecone lights!!! LOVE! Anything from Jackson & Perkins would be great. I have many of their roses in my yard as well as other plants I purchased when they were located in Oregon, my home state. Thank you for your beautiful ideas. The log lanterns and the orchids would add a nice WINTER touch. Oh, Yvonne – your trees are always my favorites!! Thank you for sharing your great tips too! You are so generous!! I know it won’t look like yours, but I am going to add some of these ideas to my tree. Just beautiful! The Merry Memories Garland is beautiful!! I haven’t had a live Christmas tree for years, but the table tops won me over. PLUS the pinecone lights are wonderful! Happy Holidays! Thank you so much for offering such a lovely and generous giveaway. The pinecone lights and Cozy Rosemary Christmas Tree would definitely be on my shopping list. Vintage Caddy with evergreens and berries for me. Their roses are gorgeous and yes, those pinecone lights would be an attractive addition to any tree. I would love a festive wreath for my front door. The 24” Noble Fir Wreath from Jackson and Perkins would look amazing. Thank you for the opportunity to enter this giveaway. Love all your blog post and decorating tips! I would love the Jackson and Perkins cheeseboard for my holiday entertaining, when my family comes for New Year’s Eve! Your tree is gorgeous! I love a white tree!!! I really love the Jackson and Perkins pine cone lights…wow! Love the Holiday Hydrangeas! Beautiful all year around! Thanks! The log lanterns would be perfect. I live in Colorado and it just seems so fitting. Thank you for your blog! Merry Christmas! I would like to have the Jackson & Perkins Harvest Window Box. I would love to grow fresh herbs for cooking right in my kitchen! The log lanterns would look lovely on my porch. I live in the woods and decorate my porch with natural elements. Love the table top tree! I love flocked trees and would have never thought to add flocked branches to my unflocked tree. It’s such a smart and easy way to get the look I want without tossing my perfectly good tree and the pinecone lights are beautiful too! Love the Merrie Memories Garland! Also your tree is gorgeous!! Your tree is beautiful and the Jackson and Perkins pine cone lights look great with the rest of the tree! I absolutely love paper whites for all year long. The evergreens are always beautiful and I think really add that extra Christmas/ holiday feeling to any home! Vintage Caddy with evergreens and berries! Magical Xmas tree is beautiful. The whole site was fun to look at. Love the lighted Home for Christmas Noble Fir Wreath, the 118-inch bubble lights, and the white Exquisite Orchids. These will bring a real sparkle to my home for the holidays. My favorite is the gardenia; nothing like that lovely odor! I found many favorites, but partial to the mercury pine cone lights,they are beautiful, so many gift options. Who could pick just one item?! I can picture the Rustic Noble Fir centerpiece on my coffee table and the awoodlsnd deer string lights on by my fireplace. Love the natural Cody feel of it all! I would stock up on plants for sure! Their Urban Succulent Garden, the Blue Star Hyacinths and the Eco Planter Herb Kit! I’m so smitten with the white orchids. I just love them! I also love the pine cone lights! So hard to choose just one item from their site but the Believe In Christmas Tree is beyond beautiful – that would be my pick. Thank you kindly for the chance! I would love the fragrant lavender wreath; the pinecone lights, and so much more! Absolutely love your posts! The pinecone lights are fabulous, I haven’t seen anything quite like them before. I would love those! Love the sparkly pinecone lights. The pompon throw is so cute too. Thank you for all the great tips for filler in the gaps between tree branches. Love the pinecone lights. That’s what I want to win. I absolutely love everything but if I had to pick something in particular, I do adore the Magical Tree in the basket on your vignette. I love everything from J&P. Any of the amaryllis or the live Christmas trees would be amazing. I love how you decorated this tree! Love the pine cone lights and the Raleigh Tavern Lantern and the Perennial Gardener Tool Set and EVERYTHING Jackson and Perkins has to offer… Thanks for a chance to win. Merry Christmas. Love the Jackson & Perkins Pinecone Lights! Please enter me in the drawing. Thank you. I have ordered a number of things from Jackson & Perkins over the years and have been very pleased with the products. I have one of their potting benches that folds flat for storage, which is very handy.I love the paper whites growing kit. For some reason I like their scent. While I absolutely love everything, I’m partial to the Amaryllis. The frills and fanciful is especially beautiful! I also love the snowman cheese board, and that little silver snowman shaped cheese knife – I just gotta have it! I adore the pine cone lights! I want to do an outdoor themed tree with bird ornaments and those lights would be the icing on the cake!! The J & P items are lovely, the rustic evergreen centerpieces are so pretty and would great in my house !! Wow! Such pretty things! I would sure love to have one of their beautiful magnolia leaf wreaths and a couple of black lanterns. They make it difficult to choose. The Home for Christmas Noble Fir wreath! Beautiful! I would love to see that on my front door! Jackson and Perkins have some beautiful things. I just loved the pinecones lights but they are sold out. I think I might get that cute little Christmas tree you used in your post. I will take it to give as a gift for our yearly get together, for the hostess. I love the Christmas tree lights!!!! What a wonderful addition they would make to our silver and crystal tree!!!! I would love some pots of amaryllis bulbs, and just about anything else on the beautiful J&P website! I sure would like that little tree with the organic feel to it. Lovely idea. Like the rustic with the shiny and shimmery. Goodness so many pretty ideas! It would be fun to shop through all their gorgeous things. Love your posts! Merry Christmas ???? I love the Woodland Log Lantern’s. They would look great during the winter months. I would love to win this! I would get the advent calendar, the woodland deer Christmas tree and some delicious chocolates! Looking at the vast number of delightful items available at Jackson and Perkins made visions of sugar plums dance in my head! The snowman cutting board caught my eye. I’m really loving the red mercury lanterns! They would look so perfect on my dining room table! Everything you do is so beautiful. On the JP site, the Merry Christmas tree with the gold base is one of throngs Inwould enjoy having in my home. You always have such beautiful ideas! Great link to the website of Jackson and Perkins, I love the Yuletide Hanging Basket! (bummer it’s sold out!) The little tree you shared today is beautiful too…I like how the ornaments are grouped in threes…I think I’m going to copy that design! It’s all beautiful, but these would look especially nice in my home. I love the Nobel Fir wreath, the Believe in Christmas tree and the Golden Grandeur amaryllis from J & P…or most anything they offer, since their products are beautiful!!! Yvonne, your Woodland Christmas tree is special, too. I love so much on the Jackson and Perkins website! Especially smitten with the chefs herb caddy. Love at first “website”! I adore amaryllis! They brighten up a winter room, particularly after the Christmas ornaments come down. Then you can plant them in the yard and enjoy them every year! My Mom used to be quite sad after the holidays passed. Then she became proactive about it and filled her sunny kitchen with amaryllis and paperwhites every Jan. What a feast for the eyes and nose! They always make me happy now! your tree is just gorgeous! and I love everything on the Jackson and Perkins website ! I Love, love, love the beautiful tabletop Christmas tree!!! Oh my gosh I love your ideas about the fillers and the flocked snow and the balls with epson salts, too late to do this year! But definitely next! It is so hard to to pick one thing at Jackson and Perkins, I would love the pine cone lights, the lanterns etc…. Pick me Pick me!! !Just kidding but I would love to win! I hope you do on FB or email though! I would choose Paper Whites. I’ve loved them since childhood and not had them since. Good Tidings Gardenia would look and smell wonderful on Christmas Morning. I would love the Rustic Noble Fir Centerpiece. I visited the Jackson and Perkins site and what a treat! I loved all the tabletop trees, their selection of succulents was awesome too! Also your pine cone lights are sold out ?Oh well there is always next year! Many blessings to you and yours this Christmas ? I visited Jackson & Perkins. There are so many beautiful things on their site that it is hard to choose just one! The Lavemdar Wreath is absolutely gorgeous! I love the Lavender Wreath! Could use it pretty much year round. Jackson and Perkins has some lovely Christmas items to grace our homes and in just a few months, it will be time to think spring flowers again! I really liked the Holly Jolly Evergreen table top centerpiece, although it was hard to choose among so many super items. I liked the galvanized container for its versatility and farmhouse charm. I will enjoy it during the holiday and after. The Lovebird Candy Cane Cactus would be perfect here in Arizona! I love the pine cone lights. I collect crystal Christmas Ornaments and this would be a fabulous addition to my collection. I would love to have the snow throw and the pine cone lights. I love the Holly Jolly Table Top Centerpiece. 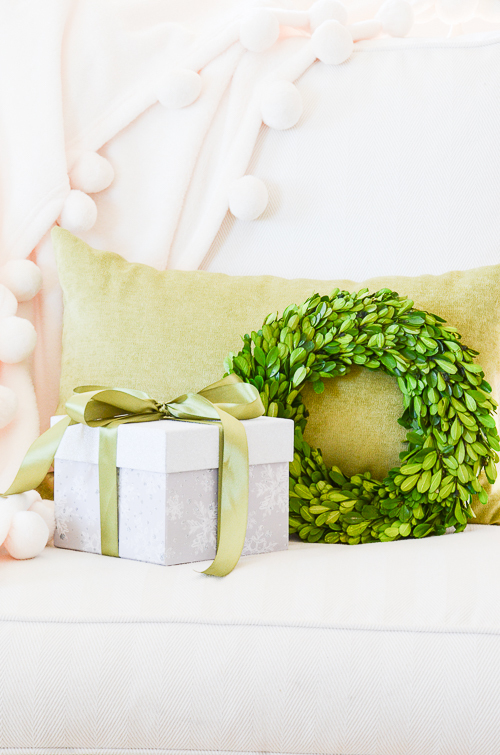 It would add holiday flair to any room! The pinecone lights are really pretty, and would look lovely in a vignette for the snowy season after Christmas or a skating/snowshoe party. The rabbit stepping stone! Would be perfect throughout my front garden inside the driveway circle. That garden will be all high desert, drought tolerant perennials that the butterflies, bees, and hummingbirds just love! I love the silver waxed amaryllis bulb. I’m partial to white blossoms but the red is beautiful!!! The Woodland Log Lanterns would be my choice. Love them! I adore the vintage holiday caddy centerpiece on the Jackson and Perkins site! I like the little tree you have (I already forgot what it was called) and the magnolia wreath. Thanks for the giveaway. Also, many thanks to all of your tips and tricks and beautiful style. The Winter Wonderland Christmas tree is beautiful and I love all the natural decorations. I love the winter has come basket., especial to send to my friend in Arizona. I love the JP blooming plants like the the beautiful paperwhites! The Home for Christmas tree is so sweet and wow those covered with yummy goodness Apple’s sure make me hungry. Good morning Yvonne. Thanks for the vignette tips. I couldn’t get the link to Jackson and Perkins to work but I would like a little tree like yours and probably would find lots of great things there. Thanks for your help. I already ordered the Winter Woods Tree which is just adorable. I couldn’t resist! It’s hard to chose a favorite, but I just love the stacked blocks count down to Christmas piece. Thinking about that for a Granddaughter for next year! I would love to have the bullalo.check throw in red and black.. Looks soft and warm. Loving the pinecone lights! Your tree is beautiful Yvonne. I love your theme this year, the black, white and red looks elegant and so festive. Just went on to J&P and I’m loving the Reindeer Games Holly Centerpiece for a vignette and also love the small Christmas trees. Merry Christmas! ? ??? Such a lovely site! It was a pleasure to scroll through the Jackson and Perkins products! I loved so many, but the magnolia wreath was what caught my eye! It looked just elegant! Yes, that caught my eye too Pamela! What a treat for the eyes!! I am trying the less is more idea this Christmas but those pine cone lights are beautiful!! We own a small cabin in the woods and the would be perfect!! Just gorgeous!! Everything on this site is wonderful! I’d never before known of the Jackson and Perkins site, and thoroughly enjoyed looking through the offerings posted for the holiday season!! There was not a single thing I would not like to have!! There is so much available that is perfect for the home, for holiday gifts, and for host or hostess gifts over the holidays. And, the edible treats look quite tempting too!! A favorite? ?…so difficult. I absolutely love Christmas decor!!! I’d have to say that the wreath made of magnolia leaves is way up there for me!! You are so right Dbbie! I loved looking at everything on jackson and Perkins. what a wonderful site. i am so happy to find a great company to order more strands of the battery light sets on copper wire. Of course, i would love to try some of the pinecone light sets. This year I decorated in red & white with a reindeer theme- the reindeer throw would look so perfect on my porch. I would love the woodland deer christmas tree. Thanks for the giveaway. I love everything organic! The colors are beautiful that mix together the season’s best. Brilliant colors are so beautiful! The magnolia leaf wreath is perfect for Georgia! Thanks for a beautiful post as always! I would love to have the bulb garden but it looks to be sold out. Also the reindeer throw in that soft color is beautiful! Those pine cone lights are awesome too. Your tree is “Heavenly” your guest will love the surprise change. I have had a white and silver, crystal and pearls tree several years but this year made a drastic change to red and white ornaments with lots of candy stripe touches…change is fun! My wish list: Coronation, Festive & Fanciful amaryllis and the beautiful White Dawn climbing roses …what a generous company! I love the Urban succulent garden…so cute! And I do love the pine cone lights! Your tree looks amazing! Thank you for the lovely ideas! Hi Glenda, I thought the Urban Succulent Garden was gorgeous! I would have picked that among others. The Lily of the valley is such a delicate flower, I always love them and so, that would be my choice. Oh. My. Goodness. I have just discovered your site along with Jennifer Rizzo and Ella Claire! I am in decorating heaven after retiring from teaching. I would love the fresh garland and amaryllis. All of you young women have inspired me! Who knows, I may try my hand at blogging! Lol Never too old to learn something new, right? I just hope I can find your podcast! Haven’t listened to that yet. I would encourage you Cathy to create a blog! I was a teacher too and now I’m using my creative energies to teach and inspire other to decorate etc. It’s my passion! You will also LOVE the great community of bloggers. Like a nice girl sorority! BTW: welcome to the StoneGable family! Jackson and Perkins was pretty interesting. Cocktails and Camping. Funny. Lovely greens and live plants. Too many great choices! I’d love to give the mod succulent holders to my daughter. Then, I would order all the toffee packages for myself ! Thanks for opportunity! I would love the pine wreath. I have always had an artificial pine wreath but nothing smells better than pine at Christmas. I love your tree! My favorite Jackson and Perkins item has to be their Amaryllis collection, specficallly the Golden Amaryllis in the golden metal pots. What a beautiful tree! I love everything you’ve done to it. I am putting the snowballs on my list to make next year. I never knew they could be so easy to make. Thank you for sharing. ooooh….I am loving the garden party string lights….but anything shiny and sparkly makes my heart skip a beat!!! I love your snowy tree . 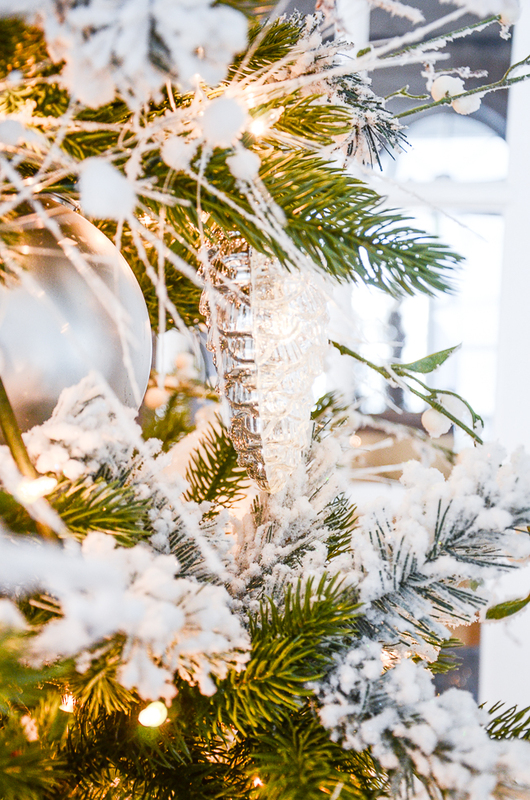 The sheepskins around the base of the tree is perfect to complete your winter wonderland. Merry Christmas! I love the amaryllis and all the plants! One of each would be heavenly! I get some amaryllis and paperwhites to liven up my desert home. The item I would most want is the dried lavender wreath from Jackson and Perkins. Lavender and I have been in love since I was 5 years old and visited my dad’s great aunt in Lancaster, Pennsylvania. She had dozens of lavender bushes in her garden. She made tea with lavender that day and gave me a dried bunch to take home. The smell always reminds me of her and her victorian home. Thanks so much for chance to win some lovely Christmas decorations. Oh my so many wonderful items, was having such fun looking at everything,thinking how I would enjoy it and decorate with it for many years to come. Hard to choose, found several items but think the Home 4 ChristmasSled swag would be perfect. Have always wanted a sled to decorate with but are so hard to find at thrift stores here. There were so many wonderful items I would thoroughly enjoy. Have wonderful Christmas and rest of week. Glove the hand made ornaments and white faux snow look. The lighted pine cones add some pretty sparkle. I love the Home for Christmas Noble Fir Wreath, it is so pretty. The flocked tree really is pretty. I might have to try that on a tree next year. The J & P Giveaway is amazing. I would probably have to opt for an outdoor potting bench. BTW: I am making your Holiday Brisket Dinner tonight. YUMMY!! Love the pinecone light strings. Your attention to details really helps make everything extra special. An example is the little white pitcher with pinecone fluff sitting in your kitchen. I did one too and my grandson noticed right as he came in to visit. The woodland lanterns would look great on my front porch. When lit in the evening,they would welcome any guests. Everything is so beautiful. Love the paperwhites. I love The Magical Christmas Tree…I have a small apartment, it would look nice in my home. I love the paperwhites for Christmas! But the Wedding Wind Chimes look like something I’d love to hang near my front door so I could hear the chimes while working in the kitchen. I love the woodland lanterns. There is something about the glow of light that just makes you warm and calm in the winter. Would love a beautiful rustic basket full of red Amaryllis ! They add a touch of Christmas in any room of the house! I would love to have that beautiful Buffalo Check Throw! Love the pumpkin luminaries, and if I got them, I would leave them in my garden all year! I love all the live plants from Jackson and Perkins. How could I possibly decide! I love the chefs herb caddy. And the snowflake and rain deer throws look so cozy. But… I think I’d have to go with your lighted pinecones. Love them! I love the Jackson and Perkins wreath with the deer antlers. Also, everything on their website! J&P has such wonderful holiday offerings. I love their live decorated Christmas trees, like the Merry Memories one. Merry Christmas, all the Christmas posts are just beautiful. I would have loved to have bunches of the pine cone lights, too. However, they are now sold out, but I know I would find lots of other things with a gift card! Merry Christmas to you and yours! How sweet Maureen. God bless you! I love all your tree tips, I’ll be looking for materials for next years tree. I love the Crystal cone lights, they’re sold out!! I also love the woodland lanterns. We are trying to get some word about them being restocked. I’ll let you know! Hugs! I love your colors this year! I also like the Jackson and Perkins Holly Jolly Evergreen Tabletop. Thank you so much for sharing these wonderful ideas. Our tree is covered in white ornaments, especially pinecones, along with a little burgundy, but something was missing. I am on my way out the door to pick up some flocked filler! Also, going to purchase those pinecone lights when they are back in stock. Merry Christmas! Your tree is just beautiful! I love the Crystal Cone Lights although they are sold out as is the Snow Cone LED Candles which I adore. Merry Christmas to you and your family. Luv, luv, luv your tree! It’s like eye candy; sparkling yet cohesive. We have resorted to whipping out our faux, table-top, tree out of a huge bag, fluff the branches, and reattach any fallen ornaments! This year, it’s going to be positioned on our dining room table. I love teal so used aqua, white and silver ornaments with a few old timers with lots of memories. I would love a house full of JP Amaryllis and Paper Whites. Also, the “Please Close the Gate” sign. I adore your blog and I take away many helpful ideas. Love the pinecone lights. Never seen these before. I just love all of your help! What’s not to love about everything Jackson & Perkins, but I especially love the pumpkin luminaries. Cascading lights and orchids. Pine cone lights sold out…but always next year…. Pine cone lights!! How amazing!! Love their buffalo check throw! Enjoying your Christmas home again this year, so beautiful. Following your ideas for greens, cones and candles with few vignettes, and keeping it more neutral, as well. Love the J and P site. All the natural florals are lovely. Would especially like to snuggle under the snowflake throw. Actually found few great gift ideas for those who have everything. Your tips are never a disappointment. Thanks for the dedication all year around. The Deer Light String is on order as we speak, and the price is right in our budget. We no longer put up a tree but do a woodland scene on the dining room sideboard. The lights are just perfect for our basic Winter Christmas décor and can be used longer than just over Christmas. Probably from all of your blog readers! I’ll settle for the Raleigh Tavern Lantern and the hanging red stars! Sorry about that, Joan. I’ll try to see if they will be in again soon. Your tree is absolutely gorgeous! I just love your ideas, even though some of them I’ll end up using the next year, but you’ve already given me some tips for my tree for next time. Thank you so much for all your Christmas Tree decorating ideas! Your Christmas Trees are always gorgeous whatever theme you choose. I like the Magical Christmas Tree on the Jackson & Perkins website. I thought a tabletop tree on my kitchen counter decorated with cookie cutters and other small kitchen items would be adorable. Your tree is gorgeous, Yvonne! I love the look of of a tree with clear lights and white. It reminds me of a snowy Christmas wonderland. Your Jackson and Perkins pine cone lights are so pretty. They also would look great on a mantel. If I won, I would choose the Snow Kissed Orchid so that I could enjoy it during the cold, dark winter. I love orchids too Paula! All of the Christmas selections are so beautiful! I am especially fond of the paper whites or anything with fruit! What a beautiful Christmas tree! I just love how the pine cone lights make your tree sparkle. The pine cone lights are my favorite from Jackson and Perkins and the Thomas house lantern! I would be excited to receive a gift card from J&P. We would be thankful to choose from the many beautiful things. We don’t have a tree this year. Your tree is beautiful and I enjoy your blog. Merry Christmas to you and your family! I LOVE the pinecones lights ! They are just beautiful! Your tree is always done beautifully Yvonne. I love the green and white this year. I love the winter wonderland bulb garden. I’d love to get new stockings for our family’s names, especially with out newborn baby having his first Christmas. Also, I did a diy advent calendar using toilet paper rolls, but theirs looks so elegant, I just may have to get that for next year. I like the holiday mix fruit box. Smelling fresh fruit at Christmas lets you know it’s Christmas time as well. Your tree is gorgeous! Such inspirational posts Yvonne. Thank you! So many beautiful items on the Jackson and Perkins website. Wish your pinecone lights were still available! Other favorites were: Merry Memories Deluxe Christmas Tabletop Tree, all the stunning Amaryllis, and the 6 month bulb club! Lots of beautiful things on the Jackson and Perkins website- all of the amaryllis and loved the Happy Holiday Penguins and the Pumpkin luminaries and the Let’s Be Jolly Cypress Trio (simple, but beautiful). And thanks for all the tips on making the tree beautiful. Really gorgeous! The pinecones lights are amazing!!! Love ?love, love the pinecone lights. My tree is also in the new brighter green, white, silver and crystal. Can’t You just see those pinecone lights on my tree ? Merry Christmas Yvonne. I love following your blog…so much awesome information. Thank you! Love the rustic green lantern! Winter Candle in Red Glass and the String of Deer Lantern lights. The TWO, once illuminated, make me even more thankful and blessed that I still have the gift of smell and sight!! Autumn/Winter Season is MY January 1st. A time for reflection, inspiration and improvement. And, those two items just soothes my soul and make me feel hopeful of good things to come!! Too hard to pick just one thing! Loved the Buffalo Check throw and the Reindeer throw – I love cuddling up in wonderful throws on these cold winter nights. Also loved the beautiful Christmas wreaths. Thank you for your inspirational blog! Because of your romantic white tree i set one up this year for the first time. It’s heavenly and makes our bedroom tres romantique as well! I do like the J & P pine cone lights!! Merry Christmas to all! Unique items for sale at Jackso and Perkins ! I LOVED the pumpkin luminary !!! Also many special Christmas items ! Love the lights and garlands !! Oops! Misspelled Jackson and Perkins ! I love growing amaryllis every winter & there are a lot to choose from here! What a dilemma. I also have wanted some outdoor party string lights for my screened porch & love the ones I’ve seen here. I loved looking through the Jackson & Perkins site! I think the main thing I fantasized about buying was the beautiful holiday living fir (?) centerpiece that looked to be arranged in a set of three galvanized pails – it looked really unique. I think I’m going to take another look at it now! I love the bulbs of the month…to add something for every month.. beautiful!!! Thanks for sharing and the podcast. Good luck everyone!! Looove the “Festive Amaryllis” from Jackson & Perkins. What an unusual treat. They kind of look like orchids. Wow. You tree is lovely. Like the “snow” covered branches. Where did you fine them? Wondering is they can be make so how. Love the pine cone lights and the lanterns! Would love to have the Radko christmas tree! Hello Yvonne, your home and tree are lovely. So inviting and pretty! I enjoy all your tours and ideas. The J&P site has many tempting flowers and decor items. The one that particularly caught my eye was the Vintage Caddy Evergreen Centrepiece. I immediately imagined a dozen uses for the metal caddy. Thanks for the opportunity to enter, and thank you too, for sharing your warm personality and beautiful design ideas on your blog and podcast. I’m thrilled you are listening to Decorating Tips And Tricks! We love being together and talking about decorating! Thanks for this opportunity! I visited Jackson and Perkins and though it looks like it is sold out at the moment, I love the crystal pinecone strand of lights and the “bulb club” would be awesome to brighten my home. I would order any number of the amaryllis bulbs. They are so festive and easy to force to give your home a beautiful pop of color! I so enjoyed looking at the Jackson & Perkins site.The Hallelujah Christmas tree was my favorite, but the succulents came in as a close second. I have 3 Christmas Cactus in full bloom.One has shoots from my Grandmother and Mom. It reminded me of the cactus Jackson and Perkins have for sale. Thanks for sharing. I love the mini Christmas trees and paperwhites and gift tags. Love it all. Everything is beautiful, and I especially like the pine cone lights. I love almost everything on the site! But I especially like the pine cone Christmas lights. Thanks for the chance. I want those beautiful pine cone lights! I love the 12-month bulb club. They are the gift that keeps on giving all year long. The roses are beautiful, too. My problem is the deer love them as much as I do. I would love some of the evergreen items. We have a faux tree but I love the smell of the live evergreen. I’m glad I discovered your blog. Will visit again. Hi Sandy, Welcome to the StoneGable family! Please visit often! I love the flowering gift plant club. How beautiful and a gift that keeps giving throughout the year!! Your teee is gorgeous! Your home always looks stunning!! Merry Christmas! Yvonne, I love your Christmas tree, so beautiful, I too buy sprigs with snow and some with berries and add as fillers. I went to the Nutcracker Market again this year with my daughter and bought some more of their poinsettias to add as fillers, so beautiful. If I were to win the Jackson and Perkins giveaway, I would love the amaryllis, they are just so beautiful. Oh…from Jackson & Perkins, I would choose Climbing Roses. I wouldn’t even care what color. Always wanted to grow roses and have never had them but have fond memories of them climbing at the family home. I loved the festive and fanciful amaryllis and its unusual color from Jackson and Perkins. I also want to say how l enjoy all the tips for Christmas decorating. Thanks Yvonne! How exciting to have the chance to be a part of this offer! I simply love the Magnolia Leaf Wreath! Blessings to you this Advent Season! You sure bless me with your posts! Love the simplicity of this tree. Your tree is breathtaking and I can see why it is the focal point of your Christmas decor. I am so in love with your pinecone lights and would string them in several places. Jackson and Perkins had so many items I’d love to add to our home and Christmas decor. There are several lanterns that would be fun to have to add a coziness. And I absolutely love the little trio of galvanized pails with the evergreen, I can picture it on our patio dining table with some candles around it. Thank you for sharing your ideas and the Jackson &Perkins site..
Yvonne – you’re so clever … I always learn something new from you! I never would’ve thought of cutting garland apart and using that as filler. Ingenius! The live plants on the J & P website were gorgeous, but my favorite holiday offering was the red and black buffalo checked blanket! AMARYLLIS!!!!!! red one, white ones — for every roon in my house! Jackson and Perkins has so many beautiful things! I love the domed terrarium and the Home for Christmas Noble Fir Wreath, and the woodland deer light strand. There were so many things I liked! I bookmarked the Jackson and Perkins site for future reference for gifts or for something for me. The craftsman glass hanging lanterns would be the gift that keeps on giving all year. Christmas blessings to you. What I would like from Jackson and Perkins. It would be good tools and wonderful plant items for myself and others. I also enjoy reading your daily blog. I hate it when I am crazy busy! Your blog has become such a blessing! 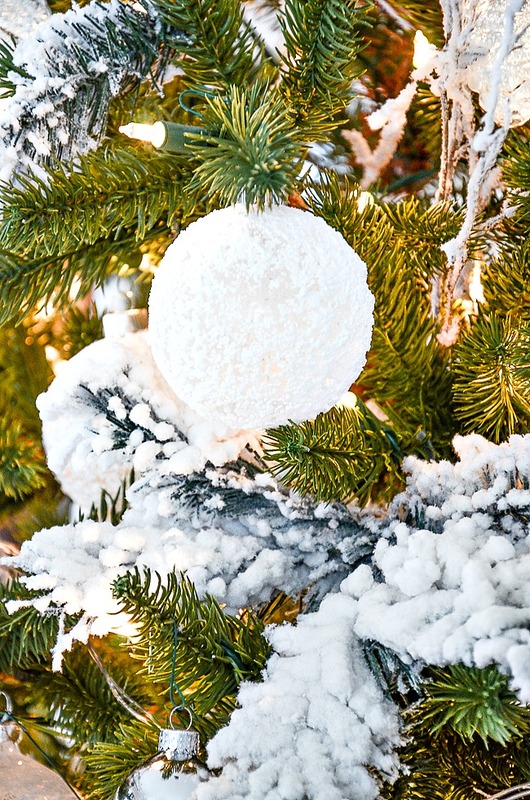 I just wanted to say that I loved that tree and really like the idea of the snowball ornaments. I love the Merry Memories Deluxe Christmas Tree Large Tabletop Tree. And there are some great birdfeeders too which aren’t Christmas decor but would make great gifts for bird lovers. Where did you purchase your zebra rug? I love the log snowflake lanterns and the pine cone garland! I do love the pine cone lights! They give your tree a special glow. I would love the peppermint Christmas cactus to go with my pink and my red ones. Or maybe the lavender wreath. That is my favorite scent. Everything they have is wonderful. Your whole house looks so beautiful for Christmas! I would love some beautiful faux garlands to add to my home for Christmas! Thank you for the giveaway! Hard to choose..beautiful lanterns, buffalo check throw. Lovely things, generous chance. I love the snowman cutting boards. Thanks for sharing. Oh my there is so much at J&P all is beautiful … all sold out of the pine cone lights but I do like I’ll be home Christmas tree and other items although if I could I buy one of everything!!! LOL!!! Love the fresh fruit and delicious looking chocolates!! Yum!! The red buffalo plaid throw, any lantern, 12 months of flowering plants club. Oh what a lovely Christmas it would be if I won! Live flowers are always at the top of my wish list , and J&P has beautiful selection. Thank you, Yvonne, for sharing your wonderful tree & expertise …Merry Christmas! So many great ideas . . . so little time! I would love to give the Winter Wonderland Bulb Garden to my Daughter and I wouldn’t mind one for myself! I really loved the tabletop evergreen trees and planters! I also loved the reindeer throw! Loved your tree! Your tree is beautiful just like the rest of your home. I would LOVE to win the Rustic Holiday Evergreen Lantern!!! I have looked for a lantern with open sides like this. Thanks for the chance!!! 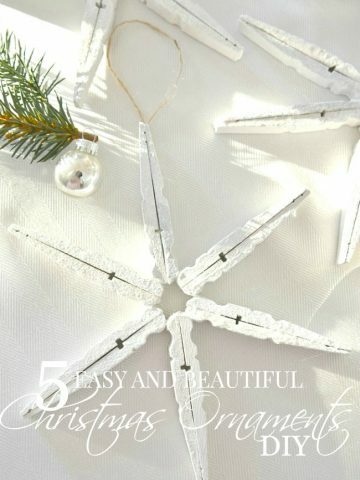 Love the idea for the white Christmas ornaments. Do you think this would work with the plastic balls they sell at craft stores? I couldn’t find white ornaments anywhere this year that were shatterproof. . Loved shopping at J&P today. Especially liked the solar lantern . I think that would be lovely Diana! I would love to have the Winter Wonderland Bulb Garden! Very sophisticate white,silver and green. Love everything about it. Thanks for the snowball tip, I will haul out the Eason salts and Modpodge and it to work. Your tree is lovely! I would like the gift card to buy candy cane Christmas cactus. Your right Yvonne!!! I do want to use that J & P gift card to purchase some of those beautiful pinecone lights. Thank you for the opportunity to participate in this giveaway. I love the lanterns that look like logs. They would look fabulous on my patio or even in my dining room. Thanks for sharing this website. I receive catalogs from them but never checked out my their website. New favorite. I visited J&JP website. Love the Christmas flowers – they look so bright and pretty! All the lights and bright colors make the home. Oh my goodness, so many beautiful things. I would for sure choose a table top tree and then choose from the lighting available. Everything was beautiful on the Perkins & Jackson site! Thank you for introducing me to them, but hard to pick one thing! The pine one lights are a favorite, but they are sold out. Will be sure to check them out early for next year. I would love lots ofwhite narcissus blooming all over my house, I also use the same color scheme in my house! I would love to have the Snow Kissed Orchid and the Charming Christmas Bulb Garden! Love the clear white pine one ornaments! Love the home for Christmas tree! And the lights of course!! I visited the J&P website. The orchids and Red Lion amaryllises are beautiful and are number one on my list!! Love you winter wonderland look. I also love the idea about Epsom salt and the mod log to roll them in. It sounds like a great craft to help my grand children with when they come to visit. I love the Snowman cutting board & spreader on Jackson & Perkins site! So cute! I was listening to the podcast today and had to laugh. Anytime my husband and I moved into a house with white walls we both have hated it! My favorite wall color we used was a light-medium taupe from Sherwin Williams. I wish I could remember the name of it, because that color was gorgeous with all my artwork and furniture. Your house really looks beautiful decorated for Christmas! LOVE the pine cone lights! Love the white gardenias! They create such beauty of fragrance in the winter. January would be great to start the new year with a touch of soft white and warm wishes for the garden that will come! Your Christmas tree is beautiful!I love the Home for Christmas tree from Jackson and Perkins! What a wonderful collection of plants to add a personal touch during the holidays. I would enjoy having the Gardenia plant in my home. And hopefully I could keep it alive all year long! The beautiful fragrance reminds me of my Nana’s garden in Florida. Hi , I love the holiday lantern !!! Your tree is so lovely! I look forward to doing themes in the future. Haven’t really yet. I look forward to your post each day -it’s like having coffee with a girlfriend ! I knew immediately what I would purchase from Jackson & Perkins …ROSES . I would get Miss Behavin and Walking on Sunshine and start a new rose garden ! So many lovely things at Jackson &Perkins. I think my favorite is the Radko Christmas tree. Very pretty. Your tree is beautiful. A winter wonderland. The red amaryllis on the Jackson and Perkins website is absolutely spectacular! I would definitely like to buy the pine one lights and the peach tree and one of the many beautiful wreaths! Lovely things for sale here! 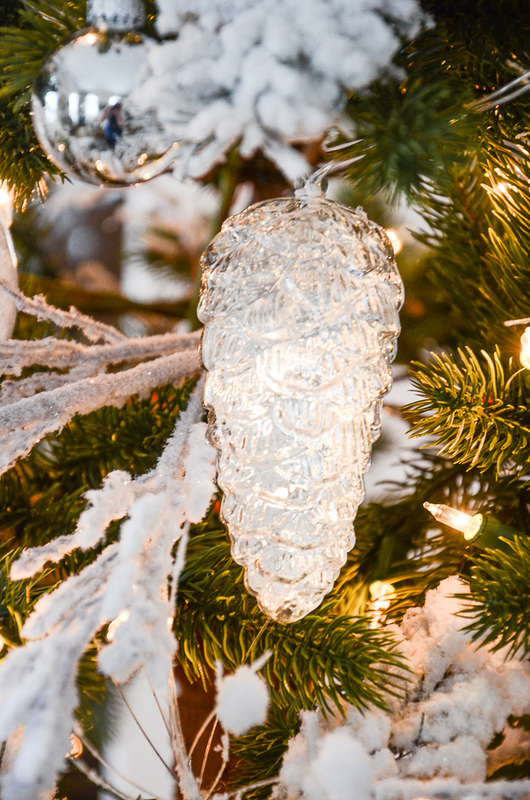 The bubble lights on silver sires are so pretty, and would look gorgeous in my tree! My fur babies are pretty well behaved, and leave my Xmas decorations alone! Everything is just so pretty! Love the deep red color of the velvety Amaryllis blooms. Beautiful! Thank you Yvonne. Your tree is beautiful. Love the filler idea and the Pom Pom ornament. Wish I could follow you around for a week. Your ideas are so creative! Love the Woodland Log Lantern! The log lanterns I have seen in some of your posts (although they appeared more flocked) are my favorite! Love, love, love the pinecones lights. Gorgeous!! Any of the amaryllis plants would look beautiful in my home. I also love the pine cone lights! I love their Lutyens Bench – such a classic. In black it would look amazing in my entryway. Love, love, love DTT! Beautiful! Thank you for sharing your tips Yvonne. Beautiful things! I like the Cardinal Birdseed Wreath! I’d definitely get some of the pine cone lights (hopefully they bring them back since they are sold out), but I’d also love the throws they have. I’d also enjoy the bird seed wreath and ornaments so I can decorate an outdoor tree just for the birds! Thanks for another great giveaway! Wow, there are so many beautiful things. I love flowers, the Festive Flurry Amaryllis, the paperwhites and a Christmas swag would be at the top of my list. There are many more beautiful items it would be hard to narrow it down. Thank you for the wonderful tips for decorating a Christmas tree. I love the paper whites and wreaths at J P! From the Jackson and Perkins collection which happens to be right in my backyard in Medford Oregon, I live in Grants Pass I especially liked the little twnikle lights, pine cone lights and the paper whites. I LOVE the silver snowflake throw – among many other things! BTW (winning a drawing aside! LOL)- Merry Christmas and a Blessed New Year Yvonne! Thank you for a beautiful year full of amazing ideas and inspiration…and scriptures and encouragement in the Lord!! I love the wreaths and garlands, just beautiful! I just finished listening to your latest podcast and I have to say you ladies are amazing and so much fun that you should consider doing a video series. You work so well together and I’d love to see you showing us items you use to decorate or the colors you described. Give it a thought! Thanks for being a listener, Diane!!! We LOVE what we do and we love all of you too! Video sounds great to me! I love all the different types of roses they sell! Oh my goodness I Love this website , I don’t think it is possible to choose 1or 2 items! Love the Wreaths and Garland, the seasons greeting Bulb garden and just about everything! Yvonne, you always have the best advice. I, too, just love the pine cone lights. Hopefully they will be available next year. Love the rustic evergreen lantern! Winter wonderland amaryllis…the pink and white ones… I keep looking back at the website and then can’t remember the exact name…68…that’s my excuse! Merry Christmas! Amaryllis and Paperwhites! Oh,my! I love them all. But my heart skipped over the Blue Christmas Muscari. I would be happy with anything from Jackson and Perkins! There are so many beautiful things. I do love the pinecone lights. They are so bright and festive. Merry Christmas!! Those pine cone lights are beautiful! I wish they were still in stock. Those pine cone lights are beautiful! I wish they were still in stock. Your tree is stunning. Love your blog. Your decorating ideas are amazing. Thanks for sharing and thanks for the giveaway. I loved the Craftsman Hanging lanterns on the website. Merry Christmas. Wow, I had never visited the Jackson and Perkins website. Thank you so much for introducing me, the possibilities are endless and just a click away! The Paperwhites are my favorite! Timeless beauty! I love grand Amaryllis bulbs and Rustic Evergeen Lantern. Love your blog…I would take any WHITE amaryllis, poinsettia, or cyclamen …I have used Jackson/Perkins for years (my e-mail !) how about a white rose bush for next Spring???? 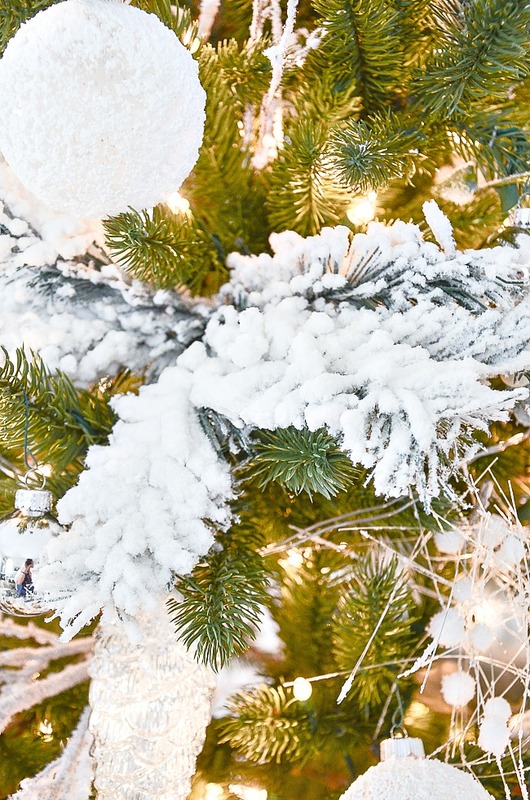 Your white tree is beautiful! I love the flocked look and the pinecone lights are so pretty! You have the gift of bringing it all together with the small touches of glam and beauty! So many beautiful pieces. Love the Pastoral Landscape Terrarium for my sideboard. I wanted to ask if you have changed the camera exposure or the intensity in the brightness values when you are taking photos or setting them up for posting as they seem to have changed recently. No, nothing different. Sometimes shooting white is very difficult and this Christmas has lots of white. I adore J&P’s rustic lantern. Think of the possibilities…..all year long! Love Love Love the pine cone lights, I always look forward to seeing new items and decor in your home. Have heard for years how Jackson and Perkins have beautiful flowers, I love the Amaryillis. Happy Holidays to you and your family. I love many things, but I would love to have the pine cone lights. Merry Christmas to all! There were many things I loved from Jackson Perkins..the woodland deer lights were lovely! I look forward to your posts daily and love your decor…thanks for all the lovely pictures..you always make my day ! Merry Christmas! You are my inspiration! That white tree is a beauty. Pinecones have always held a special meaning for me and I’ll be taking a second look at those lovely pinecone lights. Merry Christmas and thanks for all your beautiful posts throughout the year. Oh, those gorgeous Amaryllis!!! They would look lovely in my breakfast area. Jackson Perkins always has the most wonderful and freshest Christmas florals. I would love some pine cone lights. I liked the fragrant lavender and the rose gloves . I would love the pinecone strand! The wooden rustic lantern would look wonderful in my porch! I want one of everything! Such a wonderful selection!!! Winter Wonderland Bulb Garden is beautiful! I would love to have the candy cane cactus! I also would like to have the woodland log lanterns. I love the pinecone lights in a Christmas tree. Great idea! I love the little rustic bird fountain!! I would love strands of the pine cone lights! I love the woodland log lanterns! That would be my choice if I would win the drawing! Thank you! Purity in creation. Every llight is hope in a world full of conflic. Hope, faith and love displayed in a new year of uncertainties. Beautiful decorated tree. I love everything I see on their website, but right now am particularly into the various unique lanterns they have. Your tree is gorgeous! Thank you for the chance to win a Jackson and Perkins gift card! Would love to have a few of the solar hanging lanterns. I’d love to win!!! Love your blog!!! To be honest, I never looked at Jackson & Perkins! The bulbs are gorgeous. I especially like the paperwhite bulbs. They look very elegant! I went to Jackson Perkins to find the pinecone lights – all sold out ! 🙁 Next time! Anyway, the lanterns that are so popular would look so inviting on my southern front porch! That’s what I need to do – plan to make the front porch as nice as the interior of my home! There is so much to love from Jacksons and Perkins! I cannot believe it but I want to add to my pumpkin collection with the pumpkin luminaries! I saw those and really loved them too! The Ultimate Golden amaryllis bulbs looked absolutely gorgeous to me. Tried picking out the Pinecone light strands but they’re sold out. They are right, they would be beautiful year around. Maybe they will get more in. Those would be my first two choices. Then I would spend the rest on a beautiful array of flowering plants to refresh my garden. Thank you, Yvonne and Jackson and Perkins, for the chance of winning this generous give-away. Merry Christmas! Wow, all of their things are so beautiful! I love flowers and thought it would always be so fabulous to get flowers every month! I would LOVE to have the 6 month bulb club if I won! Then each month I would be looking forward to fresh beautiful flowers, even in the cooler months! How great that would be! I would like to have the Nativity Scene but all of their Christmas things are lovely! Wow, all of their things are so beautiful! I love flowers and thought it would always be so fabulous to get flowers every month! I would LOVE to have the 6 month bulb club if I won! Then each month I would be looking forward to fresh beautiful flowers, even in the cooler months! How great is that? What a great idea of using faux flocked tree branches. Definitely going to do that. That way I am not committed to a flocked tree every year. Your tree is beautiful! 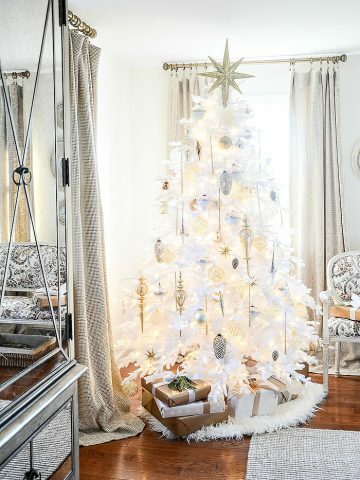 Are the flocked tree twigs all faux? Thought I could spray my own from twigs outdoors. The sponsor sight has lovely things. I like the vintage evergreen centerpiece. Thought I could change it out for each season . I love the Holly Jolly tabletop evergreens on Jackson and Perkins! Once Christmas is over, the tabletop metal display can still be used the rest of the year! Merry Christmas! I love the pine cone lights,l look forward to seeing your beautiful photos of your home.Thanks for sharing. Hi. This is my first time posting. I loved the pine cone lights! As much as I love all of your decorating tips and styles and enjoy getting all of your emails, I most enjoy your Bible studies! I just read the most recent to my husband ?. God bless you! Thank you so much Lisa. It’s such a calling for me. And please comment more! I love to hear from you! I love the Pastoral Landscape Terrarium from Jacksons and Perkins.. It is so simple and natural looking and I do like terrariums very much. Thanks for the tips on how to decorate a Christmas tree! Great ideas. Thank you for the opportunity, Yvonne! A pair of Woodland Log Lanterns would be festive for the holidays right into the winter season. 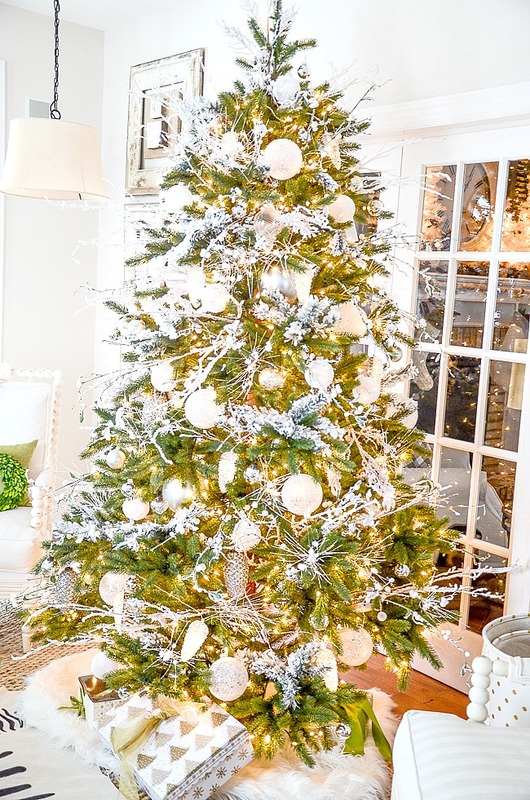 Thank you for the holiday inspiration – I love your silver, white & green Christmas Tree — fresh, modern and dreamy! Every year I do multiple trees, but my one constant is a Country Tree in our sunroom — I cover it in handmade ornaments and many Americana touches in patriotic red, white & blue. I love the cozy red and black Buffalo Check Throw — it would be the perfect finishing touch. Merry Christmas to all! What a wonderful GIVEAWAY!!! Some added “living” items would be so nice. The Holly Evergreen Tabletop is so practical because I could decorate/use it after the holidays; I love paperwhites, so the Paperwhite Bulb Garden would be so sweet; and also any of the Amaryllis bulbs… there’s just so much to choose from so I’ll stop there. Merry Christmas! An amaryllis would be my choice! Your tree is beautiful! I would choose the holiday hydrangea. Hydrangeas are my favorite:) Merry Christmas! I love the Home for Christmas Tabletop Tree! Everything is gorgeous on their site! However, I’ve never had a real wreath with greenery on my front door…it was stunning! Merry Christmas! I love this site – I would choose the magical little tree. I would love the Magnolia tree! Love the giveaway! Thanks!! Thanks for the great tips! I love a flocked tree and the lighted pine cones are so elegant! Love your tree, so beautiful. And it really fits your theme. I’d love to purchase the Home for Christmas Noble Fir Wreath. Lovely. Love your blog and tips. Wish I had a flocked tree. Yours is gorgeous!!! I really like the Holly Jolly Evergreen tabletop centerpiece! Loved touring the Jackson & Perkins sight…. so many beautiful things!!! Loved the Blue Muscari Bulbs and the Bell Jar Terrariums!!! I would love 2 big lanterns -especially red – to put by the front door! We have a new white house with black shutters and a black front door. Made a cranberry and pine wreath with a black & white buffalo check and red bow. Thanks, Yvonne, for being our role model for home decor! Linda, you make me blush!!! Thanks! Many of the items that I liked have been sold out . . . thanks for sharing their website. I would love that portable grill! You’re tree is so beautiful! You are so talented! If I could choose just one item at Jackson and Perkins it would be the solar powered lantern. I live in sunny Florida so it would be perfect to light up my sidewalk near my driveway when I get out of my car. And maybe that cute bird seed feeder to hang in the tree too since all the birds fly south to my yard for winter! The craftsman glass hanging lanterns are beautiful. Your pinecones lights on your tree are sweet as always you have the best ideas. Yvonne – I would shop for new planters for the patio area if I were to win the drawing! I also have a white tree! I listen to your podcast and when friends comment on something in my home I say – “Yvonne gave me this idea!”. Thank you! So sweet Debby! It’s our goal to “inspire you to create a beautiful home”! I would treat my home to the paper white narcissi to welcome in the New Year! Love the posts …. looking forward to more tips and tricks. I love anything from Jackson &Perkins. I love your DIY snowballs…thinking I just might make some for my snowman tree. I would LOVE to win.the Snowman cheese board ..the woodland lanterns are lovely as well . Thank you and have a lvely holiday with family and friends. Your tree is lovely! I seem to kill any plant that comes in my house so I opted for the Salted Caramel Blondie Mix. Any of the beautiful plants. Love the elegance of your tree. Great suggestions. Have saved the email for future reference. I would love to have the Holiday Fruit gift box. Thinkbig practically here. It would be easy to share and make other goodies from. That being said, I would take anything. Everything is do lovely. I would love the throw blankets…. both the reindeer and the snowflake throws. There is nothing like curling up on the sofa, in front of the fireplace with a cuddly throw and watching Christmas movies or just the snow falling out the window!! I love the bubble lights!! So beautiful and different. I would love the little Christmas trees, wreaths, paperwhites, amaryllis, all of it!! Yvonne, your color scheme this year is luscious! I am loving your white embellished tree. I would love to have a theme tree at some point in time, but for now, I must decorate our “big” tree with all of the ornaments we’ve collected over the years (each one is special), things the kids have made (I actually have a separate free for all of their precious treasures that I did not put up this year), and each tree that go in the bedrooms are too small to really make an amazing fluffy awesome theme tree! Your energy inspires me daily…I must thank you for that. Since I have been a stay at home mom, I am more disorganized than ever. I left a very busy professional life, and for 8 years since my youngest came along, I am a terrible slacker. So THANK YOU, from the bottom of my heart, for making me feel like home-making is as important a job as any for those employed outside the home, and for giving me a much needed sense of purpose. Wishing you beautiful Advent preparation for the Christ Child to come! I would like either the Perennial Gardner Tool Set 0r the Candy Cane Cactus! I absolutely love the Jackson and Perkins glass and silver pinecone lights!! Beautiful! Love those skins under the tree – how unique! Jackson and Perkins really have an extraordinary selection of things. I think my favorite at present is the Winter Woods Wreath. It’s simple yet so beautiful. I love the Urban Succulent box.Thank you.Good luck everyone. You used everything I love on this tree!! I can’t do a tree this year, so thanks for sharing yours. I’m gonna revisit this post during the season when I need a little holiday ‘boost’! I love your blog and recommend it all the time. I love your style. And I LOVE your devotions on Sunday. Much needed in this time we live in. I also would LOVE some of the pine one lights and would love to win this gift card!!!! Merry Christmas!!! Beautiful pictures as usual. So much inspiration in you blog. Golden Glow Grand Diva® Amaryllis Gift or one of the chocolate gifts would be perfect. I would love to have real amaryllis and/or hydrangea plants. They add so much life to the winter room. LOVE your blog; and the podcast; and the other blogs! Been a stalker for years. Love to have the Home for Christmas Noble Fir Wreath. I love the Merry and Bright Paper Whites. I love their fragrance so much. I sure I hope I win 🙂 Love your blog by the way. I have cooked many of your recipes and just brought to a party last weekend the Christmas Tree Cheese Block. It was a major hit. Thanks . love the cyclamen and the beautiful container the very best. I love the festive tree – very classic and it creates an area of joy and peace! Thanks for all the tips on the Christmas tree decor! Love the Silver Snowflake throw at Jackson and Perkins. Your pine cone lights are sold out. Womp, womp. Yvonne.. you never cease to amaze me in your amazing home beautification. Christmas and the rest of the year. Love your blog! I couldn’t fine the pine cone lights! ??. But I also liked the Woodard deer Christmas tree! Thank you for the chance of winning! Merry Christmas! Merry Christmas Yvonne! I Love your beautiful Christmas Tree! Thank you for all the wonderful decorating tips. I would love the Jackson & Perkins Merry & Bright Paperwhites! What a lovely, winter Christmas tree you have created. Absolutely stunning! I am doing my tree this afternoon so your tree trimming tips are perfect timing. I love the Amaryllis bulbs, and Merry Paper Whites. A great look to have when decorating in beautiful winter whites! We just built a new home and have lots of landscaping to do on rocky soil. Your sponsor just reminded me to order seed catalogs. I was particularly interested in the perenial tool set that I saw on the Jackson and Perkins website along with the cute little bird fountain. Loved your white Christmas ornaments. Jill, congratulation on your new home. I pray that you will have a very special and blessed first Christmas there. I love their amaryllis. The color is gorgeous, you don’t have to be a gardener to grown one and they last about two months! I LOVE the Pine Cone lights on your tree, but the Urban Oasis on the Jackson and Perkins site is calling my name! The Lavender wreath is lovely. I like all the silk arrangements. They look so real. Flowers always make me smile! Love the pumpkin luminaries from Jackson Perkins. And the Whimsical LED luminaries too! Love all the amaryllis, beautiful anytime of year. I visited the Jackson and Perkins website and was so impressed! I absolutley love the Cunninghamia Cypress Potting Bench. Wouldn’t it make a beautiful hot cocoa bar for the holiday season? LOVE!!! Thank you for the wonderful tips for decorating our trees! Best holiday tips ever. Thanks for offering such a nice giveaway. I love my please close the gate sign but those faucets would really compliment the garden gate sign. I’m LOVING the Raleigh Tavern Lantern! I would LOVE the Deluxe Potting Bench! I would love to have a variety of colors of amaryllis gifts and the pumpkin luminaries are beautiful! Hands down the Merry and Bright Paperwhites to keep the spirit of the holidays going through the new year! There were so many lovely things. I loved the birdseed ornaments, wreaths and houses. Thetabletop trees were divine! BEAUTIFUL as always you are an inspiration! Festive flurry amaryllis gift! I LOVE WHITE at CHRISTMAS . Your home is stunning. Your tree and entire house is beautiful!!! 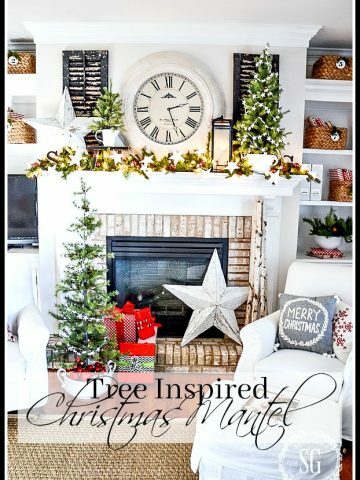 I just ordered a new faux Christmas Tree and need everything for it and I love those pine cone lights?. Maybe you could just decorate it for me! LOL!!! What a lovely tree! The “fluffing” really stands out and makes the tree so beautiful. There are so many things I could buy from Jackson and Perkins but I really love the pine cone lights and also a water fountain that I could use for my court yard. Thanks and Happy Holidays! I love your elegant tree. If the pinecone lights weren’t sold out I would definitely be ordering some of those. All of the Amarillys are just gorgeous. Any one of them would be a treat to have in your home this holdiday season. I love the amaryllis bulbs. They take a while to bloom but the wait is worth it. So many beautiful choices. I love the wood log lantern and the buffalo check throw. Light the lanterns and snuggle up in the stylish throw. Merry Christmas to everyone! Well, my list is long but #1 is the Sweet Radko Christmas Tree. Beautiful tree you have!I love the pine cone lights, but I see they are sold out. I would also like the buffalo check throw. Love your tree! I would love any of the red amaryllis plants on the site. I would also love the pine cone lights although I did not see them on the site. Maybe they sold out. OK next year I’m going to rethink and change ul tree decor, thanks for the ideas!!! I visit this site often and would love to have some of the lanterns they have listed. So many beautiful choices! The merry and brigt paperwhites are beautiful. Oh your tree is just so lovely! Thank you for all the wonderful tips. This year our Christmas decorating is pretty much non-existent as we’re starting over from scratch. I’ve been so focused on making my home cozy that I hadn’t even budgeted for holiday decorations. I checked out the site and see they’ve sold out of the lovely pinecone lights, but I would say that I’d definitely grab as many items for decorating my dining table as I can find. I just love the Raleigh Tavern Lantern, it would be what I add to my cart first! Then choose other things to go in and around it. I’m focusing on my dining room first, since that’s where our front door is. Thanks, again, for all the great tips and for the chance to win! The Christmas Magic Stars would be beautiful hanging in my entryway. Or possibly outside the front door as well :). I love the snowy tree at your house this year! It’s magical! lol, Jackie! I sometimes say that too. And I thought that I was the only one! I would love the Birdseed Chalet. Useful in the Winter and so cute! I really enjoy lanterns and those paper whites would be lovely to sit around. The Noble Fir Wreath would look amazing on my front door! What a wonderful giveaway! I really love the Raleigh Tavern Lantern. Thank you so much! I really liked the urban succulent garden! I absolutely love the crystal cone light garland. So beautiful! Oh, the Coral Charm Peonies! (I lost 3 plants this year with our wacky weather in Sacramento). Just beautiful, wish I,had such lovely decor. Your tree is lovely! I would love the pine cone lights! Your tree looks lovely and natural. Visited Jackson and Perkins and have decided, that if I were lucky enough to win their $250 gift card, I would choose some of the lanterns they have in order to help decorate our front porch for the holidays. Thanks for the chance to win. I found several plants I want. At Christmas time I love Amaryllis in my home also makes a great gift. Reindeer Games Holly is also one of my favorites. Then I also found Meyer Lemon tree and Violet de Bordeaux Fig. I am moving soon to 84096 which I believe is Zone 7. Your tree is lovely!! So wintery and glittery. Thanks for the chance to win. I love the JP amaryllis! Any color will do!! 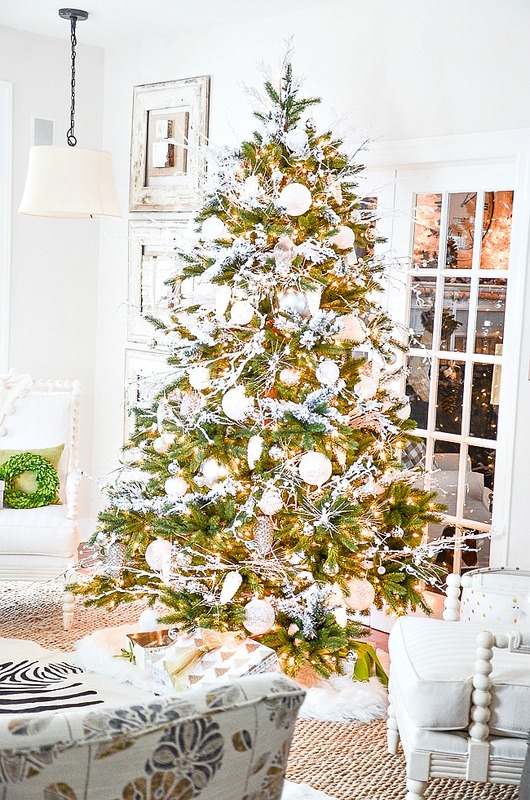 Your tree is beautiful, and thanks for the great tips for decorating it!! Beautiful tree, I like the branches, flocking and pinecone lights.The tree goes perfectly in your room. 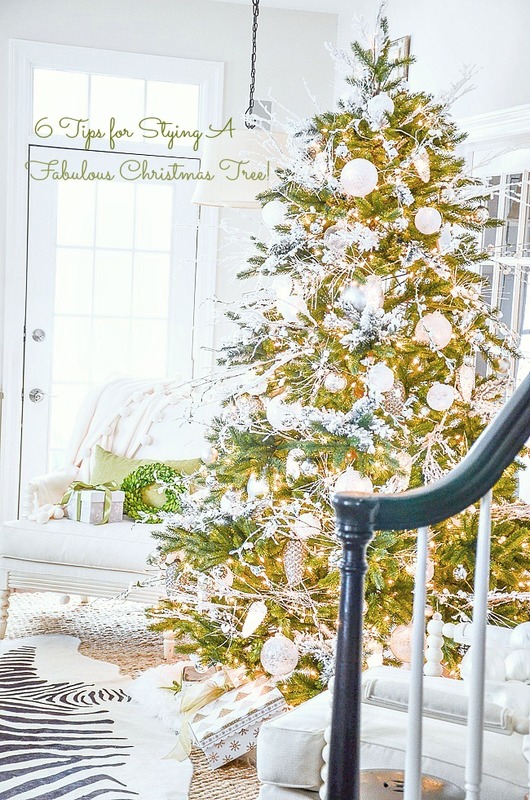 I chose to go neutral this year with ornaments and linen and champagne ribbon also downsizing from a 9′ tree to a 7′ tree.It does take many hours to fluff and decorate,but you will love the end result.Thanks for the tree tips. Sounds beautiful, Doreen. I love that you share what you are doing to inspire us. Thanks! Your tree is beautiful. I love the flocked branches and the pinecones lights. Oh Yvonnne it looks beautiful! I finally got my tree up yesterday. I’m still adding some filler but I’m happy with it! Thanks for giving us these tips. They will definitely be helpful next year! Your tree is very showy with the snow covered branches! I, also, love the pine cone lights from Jackson and Perkins. Lights and reflective ornaments can make a tree look quite spectacular. I love your tips today for a beautifully decorated tree. When I decorated my friends trees this year I adding berry pics , faux pine branches, and crystal branches giving the trees that added icing on the trees. A friend showed me an idea the other day.Take a faux pine branch,hot glue different size balls on the branch then place the branch into the tree. That way you don’t have to hang individual balls on the tree. I’m like you Yvonne I’m always looking for ideas. Have a great day??? Keep those amazing tips coming Theresa!!!! I love this tip. Gotta try it. Thanks so much! 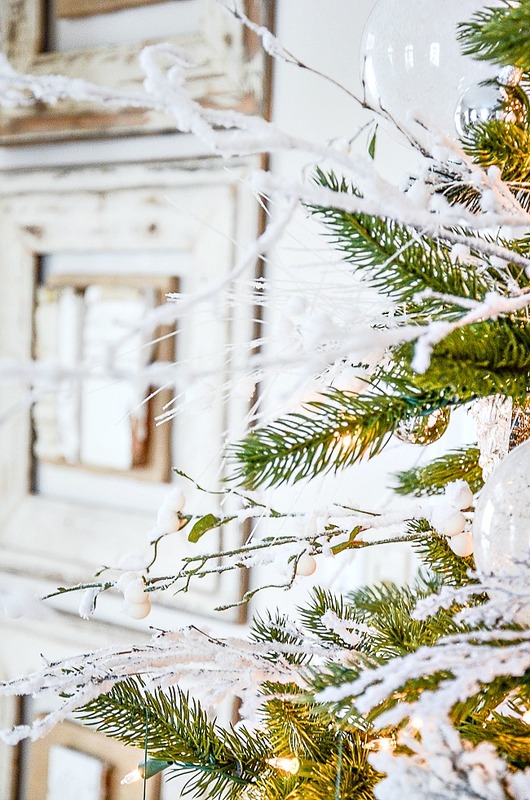 Thank you for the great tips on styling a Christmas tree. I need to work on the fluffing of my tree and I also need to get some fillers. Your tree is beautiful!!! Thanks for the decorating tips. You’re tree is beautiful. I wasn’t going to put up a tree this year, but now I’ve changed my tune. I’m doing it. Wow, your tree is beautiful. I love the home made ornaments and the pinecone lights. It must take you a while to put up your tree, but is well worth it. Phyl, I put on Christmas music and enjoy the process. I don’t do it all in one day. I spend an hour here and an hour there.I really don’t rush it. Oh my! You do have a fabulous Christmas tree! It is beautiful!! I love the pine cone lights! Thank you for sharing your plan of attack!! Love the idea of adding flocked branches. The Jackson Perkins pine cones are fabulous! I love the idea of adding flicked detail to the tree. That one thing makes the tree itself look flicked! That is one beautiful tree. I love how it just glows. Thanks for sharing your creativity with us.